The Hotel Alexandrine Opera is located in the center of 'The City of Lights', a few steps away from the 'Grands Boulevards', the main department stores and the Opera Garnier. The hotel was fully renovated in 2012 and is housed in a building of the post-Haussman period with a beautiful stone façade. The interiors have been designed around a patio giving an unexpected originality to the architecture. The hotel offers 35 intimate and soundproofed rooms, equipped with new quality bed linen and hardwood floors. They furthermore come with a flat screen TV, a mini fridge, a safety deposit box and Wi-Fi connection throughout the hotel. The 35 cozy, soundproof and airy rooms have an intimate feel, specific of old Parisian buildings. According to your preference, you can choose between single beds, double beds or twin beds. Each room has new quality bed linen and hardwood floors. The rooms are all equipped with a flat screen TV with a multitude of channels in various languages and also Canal +., a mini fridge, a safety deposit box and Wi-Fi connection throughout the hotel. Each room comes with a medium sized bathroom with shower and all the modern comfort and accessories. Various shades of colors, along with a stylish decor, give the rooms and the hotel interiors a pleasant and comfortable atmosphere. Hotel Alexandrine Opéra Paris 3 *** is open 24 hours a day, and a night receptionist is always present. The hotel offers also a concierge service. The reception room is decorated with warm tones and the sitting arrangements are perfect for relaxing. There are national newspapers and tourist flyers at your disposal. A beautiful vaulted room, inspired by old style cellars, makes for an intimate and charming experience during breakfast. Nearby, there is a large paid public parking ('Parking de l'Europe' situated at 43, boulevard des Batignolles). 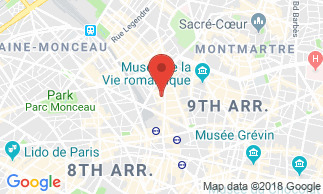 The Hotel Alexandrine Opera is located in the center of The City of Lights, a few steps away from the Grands Boulevards, the main department stores and the Opera Garnier. This 3-star hotel is easily accessible and located in a pleasant environment with many nearby restaurants where you can savor French and international cuisine. The hotel is just minutes away by metro from the Champs Elysées, the Basilica Sacre Cœur and the picturesque Montmartre district. Around the hotel, you have access to 5 metro stations. You can also take one of the buses to visit known tourist destinations (Bus stop 'Bucarest' - Bus lines 66, 80, 81 and 95 ). Continental breakfast is not included in the room rate : 12 EUR per person. It is served in the breakfast room or in your room (without extra charge) from 7 am - 10 am.